I was staring at the blaring red of the brake lights in front of me, and I knew if traffic didn’t start moving soon that dinner would be getting cold by the time I finally made it home. My mind drifted back over my day. It wasn’t a bad day, not by any means. Sure, work always seems longer in the cold winter months when the sun rises after you get to work and sets before you leave for home. And I’d overeaten at lunch, which always leaves me with droopy eyes and a sluggish mind. But I’d made some good progress on some key initiatives and shared a laugh or two with some of my colleagues, so I’d say the day was about average. As I pulled in my driveway, I looked at the clock on my dash and did some mental math. How much longer until the kids are in bed? With four boys in our house under the age of eight, my wife’s and my only hope for any sort of peace or quiet is after bedtime. Dinner, then books, then bath, then prayers. Just an hour and a half and I’d get to plop on the couch and check out until bed. I turned the door handle, stepped around the corner into our kitchen, and reeled as toy bullets started flying. Lying in wait were my wife and four boys, unleashing a hail of Nerf darts. The night descended into Nerf wars, pizza, games, and the whole family curling up in Mom and Dad's bed for some books. That night reminded me that I’m made for more than a comfortable couch at the end of the day. When I pulled into my driveway that night, I thought I wanted our normal routine to go as smoothly and quickly as possible so I could have some peace and quiet. As I lay in bed with the boys snuggled up around me, I was so glad the night had turned out nothing like I expected. That night reminded me that I’m made for more than a comfortable couch at the end of the day. Sometimes I find myself getting stuck in a rut, like my life is on cruise control. I forget that I’m meant to thrive, not just survive. Thank God I was called out of my slumber and reminded that I was made to be a great dad and husband. That I was made to be the-best-version-of-myself. I need people, events, and seasons in my life that call me back. I need to awaken from my slumber and arise to put forth the everyday effort to thrive. Lent is a season like that. Lent helps remind us that we were made for more than mere survival. It awakens us to the ways we can become a-better-version-of-ourselves. It calls our attention to the aspects of our lives that are holding us back. It shines a light on the ways we have settled for just getting by. Forty is a significant biblical passage of time. Jesus spent forty days in the wilderness after his baptism. The Israelites spent forty years wandering the desert before entering the promised land. Jesus spent forty days on earth after his resurrection. Noah spent forty days on the ark. The forty days of Lent are a time of preparation for and anticipation of Jesus’ sacrifice on the cross. It’s a time typically marked by three habits: prayer, fasting,and almsgiving. As we say over and over again at Dynamic Catholic, our lives change when our habits change. The Lenten experience is a perfect example of the Church’s intimate understanding of human nature. The forty days of Lent are an ideal period for renewal. Lent is the perfect span of time to form new, life-giving habits and abandon old, self-destructive habits. Ash Wednesday takes place 46 days before Easter Sunday, and marks the beginning of the Season of Lent. Palm Sunday takes place the Sunday before Easter. It celebrates Jesus’ triumphal entry into Jerusalem. Beginning with Palm Sunday, Holy Week is the week leading up to Easter. The Triduum begins the evening of Holy Thursday, and includes Good Friday, and Holy Saturday, ending with the evening of Easter Sunday. The official end of Lent. On this day we remember Jesus’ Last Supper, when he established the Eucharist and the priesthood. The Friday before Easter, Good Friday remembers Jesus’ death on the cross. The day of Jesus’ Resurrection. Easter is celebrated as both an eight-day celebration and an entire season of the Church’s calendar unto itself. Identifying some small sacrifice to focus on during the season of Lent is another incredible way to train your body and focus your spirit. We often refer to these sacrifices as acts of penance. Some people will give up some small comfort: desserts, soft drinks, coffee, that sort of thing. Other people will make a sacrifice of time by serving at a soup kitchen or spending some time in prayer everyday at their church. Still others will do some act of charity to focus on their fellow man. Here are some creative things you could offer up this Lent. This season calls out to us, reminding us to become the best-version-of-ourselves. The more we dive into Lent, the more rich of an experience we can have. I hope Lent is a time of incredible renewal for your life! 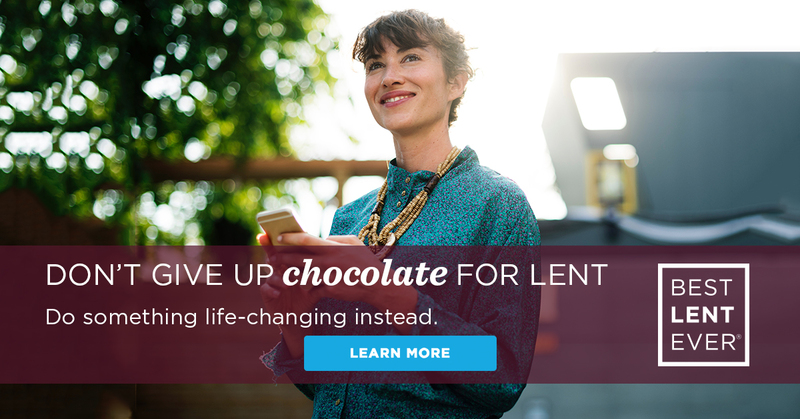 Join 400,000 other people in having their Best Lent Ever.